Installing a disc golf course in a public park is a relatively inexpensive investment that will bring a high yield in park use. Good disc golf courses take advantage of existing vegetation and terrain. 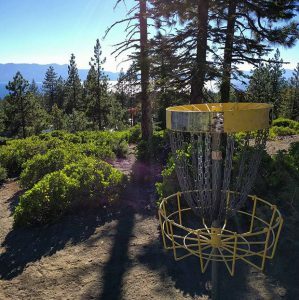 Every disc golf course offers a different shot selection and a unique experience. Flat wide open places without mature trees do not make good disc golf courses. When designing a disc golf course, the first thing to consider should always be safety. While disc golf doesn’t need as much land as traditional golf, the reality is that it is most similar to golf than any other sport. The discs we use are hard, fly far, and can do damage to people and property. 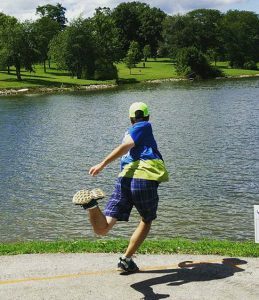 Disc golfers don’t have as much control as they think they have and can throw hundreds of feet — sometimes in the wrong direction. Watch out for tees and baskets that are close to areas that get a lot of pedestrian or car traffic. Consider areas of the park that are commonly used for other events. Soccer fields, temporary parking lots, picnic areas, popular places next to the river, or even sledding hills (for those areas that receive snow) can all be affected by a bad throw or maybe even a decent throw. 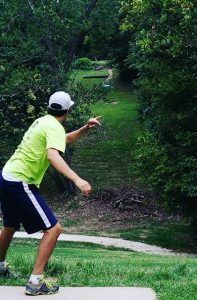 Have a variety of different disc golfers throw a potential course layout before making it permanent. Some potential negative consequences won’t be discovered until disc golfers make a few bad throws while actually playing a round. Poor, unsafe courses cause more headache than good and eventually get redesigned or pulled all together. One really big thing to remember about disc golf is that, unlike golf, disc golfers can throw a variety of different throws. Even if you think you may have designed a disc golf hole that has a safe line to the pin, there may be alternative routes that put other areas in danger. Here are some tips to avoid alternate routes causing issues. Look for areas that you do not want a disc to fly at or to. Is it possible for a disc to land there, and how can it be avoided? Don’t forget to look up. There are throws that go over the top of things, like a spike hyzer or tomahawk throw. These throws are handy for the disc golfer, but can be dangerous as they gain speed towards the ground. If the fairway is potentially dangerous for discs falling from the sky, consider putting the tee underneath a tree or obstacle, to force golfers to keep their lines closer to the ground. If you cannot find an obstacle, or golfers find a way to use a route that is not safe, consider using a mandatory. This is a simple marking that most disc golfers are aware of, and under the rules a player must cross on the correct side of a mandatory. An example is, if there is a switchback (2 fairways that are parallel and close to each other), a lot of courses will put a mandatory between the fairways. So, if there is a “mandatory left” of a tree on the right side of the fairway, my disc cannot cross to the right of that tree. That way, all of the tee-shots will be forced to go on the other side of the mandatory and stay away from the other fairway. This can also be useful if there is a parking lot, adjacent property, or other hazard that the designer doesn’t want discs flying towards. 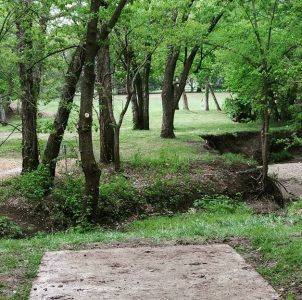 What makes a good disc golf course? While course design is limited most by the available land, designers should consider the intent of the course before is installed. Courses can be installed with the intent to be difficult to attract tournament level players, or less difficult and beginner friendly to encourage new players and family activities. With multiple teepads and pin positions, most courses can accommodate both. Course Flow – Try and have the teepad for the next hole near the basket of the previous, but not so near that it puts players in a dangerous position. Use trees and obstacles to force creativity and a variety of different shots. Watch out for potential areas to be damaged: Often there will be trees close to the end of the tee that will get smashed by errant throws. If your property contains protected plants or foliage, avoid any possible lines that invite discs to damage the protected area. Think about erosion: If your course is not one that has a lot of funding or doesn’t have a caretaker, think about areas that might become dangerous from erosion. Many people are going to walk through this area, and new trails will be blazed. If you have the time, effort, or money, think about using erosion prevention techniques if you are on slopes or side-hills. Old railroad ties are a popular, somewhat accessible resource that many courses use for erosion prevention. If the focus of your course is to attract tournaments, the course should be difficult and designed to create potential for score separation on every hole. If players get easy 3’s on every hole, that takes away from a lot of fun. Here are a few tips to designing a good tournament course. Longer holes. Anything over 400 feet is going to be challenging for a professional golfer. Anything over 600 feet will raise the par and add even more difficulty. Par-4 holes are common on Gold level courses, Par 5’s (usually over 1,000 feet) are only common on courses with a lot of space. Par 6’s are almost unheard of. Place baskets near streams, lakes, or other bodies of water that create a high risk/reward scenario for aggressive play. If there is a shot that is mostly over water, make sure there is a safe route for anyone not willing to lose a disc or a stroke. Place tee pads in a way that will encourage a high risk/reward route or a safe route. Beginner courses should be considered in areas with mixed use and limited land that would likely be inadequate to host a large tournament. The focus on a beginner course should be on being fun to play for unskilled players. For newer players, shorter holes that a new player can ‘par’ or even ‘birdie’ is more fun than carding 7’s and 8’s. This does not mean that obstacles should not be avoided as creative shot selection is one of the things that makes disc golf so fun. Losing discs can be frustrating. Areas with thick vegetation, water, or dangerous terrain can cause hour-long searches for discs. Make shorter holes near these areas that direct throws away from dangerous spots. Minimize blind shots (holes where the baskets can not be seen from the tee pad). Blind shots are less safe as you don’t know if a pedestrian is going to walk in the area you are throwing to. Blind shots can also make it hard to find your disc, especially when you are a newer player and don’t have a lot of control of where it goes. Encourage Aces (An Ace is a hole-in-one) – Getting Aces, is really fun and rather common in disc golf. There should be a few relatively wide open holes less than 250 feet. While trees and obstacles are good, it is nice to have a few mostly wide open throws where it is easy to see how far and where your disc goes, but is hard to get into trouble. Lots of available space where disc golf won’t conflict with other park activities. Elevation changes that have a variety of uphill and downhill shots. Large Parks with relatively little traffic. Traditional golf courses that are not used at capacity can make excellent pay to play courses. Ski Resorts during the summer often have potential to be excellent courses. If you would like help with course design, contact us and we can help you locate a professional designer or local disc golf club that can help you make the best use of your available land. 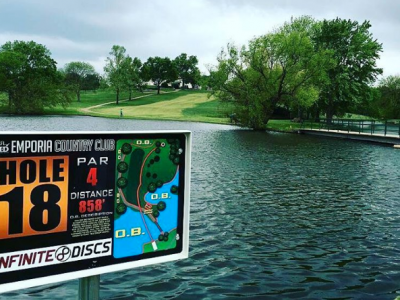 Here are more course design resources provided by the Professional Disc Golf Association.